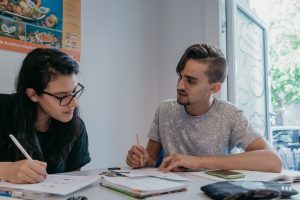 Our evening Spanish courses in Berlin are suitable for those who work and don’t have time to take lessons daily and for those who are planning to stay for a long period in Berlin. Our evening Spanish courses take place once a week and they last 90 minutes, from 6 until 7.30 pm or from 7:30 to 9 pm. Our Spanish evening courses normally last 3 months, although we always offer you the possibility of continuing when the course comes to an end. You already have some Spanish knowledge but you lack the possibility to use it? You would mostly like to practice talking and comprehension, to learn to express yourself better?